Marry Me is one of the few bridal show and events hosted and organized by the talented Luxe Wedding and Special Event Production team. While catering to a variety of brides these bridal events in Portland, Eugene and areas of Washington host many great ideas and deliver stunning visuals for newly engaged couples. With numerous cake designs and inspiration tablescapes, that have samples of beautiful floral and linens and great details that allow brides to envision their day. Also while keeping the show intimate and boutique style the bridal shows are kept to a reasonable size that doesn’t overwhelm brides and grooms rather makes them feel warm and invited and left with a sense of excitement for their wedding day. I love to be a part of more intimate bridal shows as I can really feel a connection with many brides and not rushed to talk to the next bride walking by. The Luxe team are truly committed to the wedding industry and growing the market in a great way that makes the brides as well as the wedding professionals feel inspired. I had a chance to meet a great Portland wedding florist at this wonderful Bridal show as well. Swoon Floral Design has an amazing attitude and very approachable as well which I love. Displayed was a mix of floral wedding bouquets, boutonnieres and some nice center pieces. Colors of mint green and gold added the final touch to make her flowers and feel come together. A variety of roses in red, orange, yellow, shades of white and a very deep red almost black were complimented with a mix variety of flowers and plants to compliment the look. If you are looking for a beautiful warm and vintage look based on these floral designs contact Swoon Floral design today. The Hilton in downtown Vancouver Washington has a great location right by a beautiful park and walk in lobby that make your guests feel welcome. One of the nicest places in Vancouver to have your Wedding the Hilton can host large weddings with room to move around and elaborate on the style of your wedding decor. Also host to the Marry Me Event this year made brides feel welcome as they walked and met great vendors that can help their wedding day become truly beautiful. 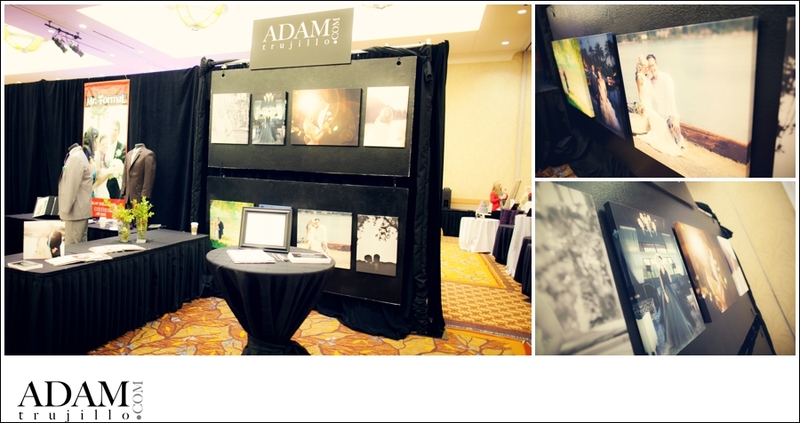 Luxe Event Productions showcased their inspiration table and theme design at the Bridal show and event. With a more woodsy and winter feel the tone was very warm and inviting. Gold, Brown and Green colors popped while snowflakes accented the table and above as you would enjoy your dinner. Gold silverware would make you feel sophisticated and luxurious as your clear glass plates a top a beautiful snowflake. Luxe Event Productions is one of Portland and Washington’s best wedding planning team. As they welcome other wedding planning and event design teams to showcase at their bridal shows. If you are planning your wedding in Portland or the Northwest be sure to contact these ladies! Another wonderful wedding and event planning company in Portland is Soiree Special Event Planning. These ladies were so friendly and very nice as we shared some fun conversations and got to know each other better at the bridal show. Their tablescape had a great burnt orange linen with beautiful green orchids and other shades of green and yellow floral throughout the table centerpieces. Also the pop of deep purple lilies worked perfect for the look as their were nice dark berries at the base of each floral piece. Sweet Dreams Wedding and Events created a beautiful tables cape with what looked like floating purple flowers above the table. Gold and green were the main colors with accents of purple made this tables elegance and glamour look just beautiful. Subtle hints of the outdoors played a role in this design that would make this look great indoors and outdoors. I love the use of the birdcage in the center of the table holding a mix of floral incorporating all the colors and textures of this table. Simply Sweets sais it all. Wedding and events desserts including these delicious little cupcakes and a host of all your bakery needs. 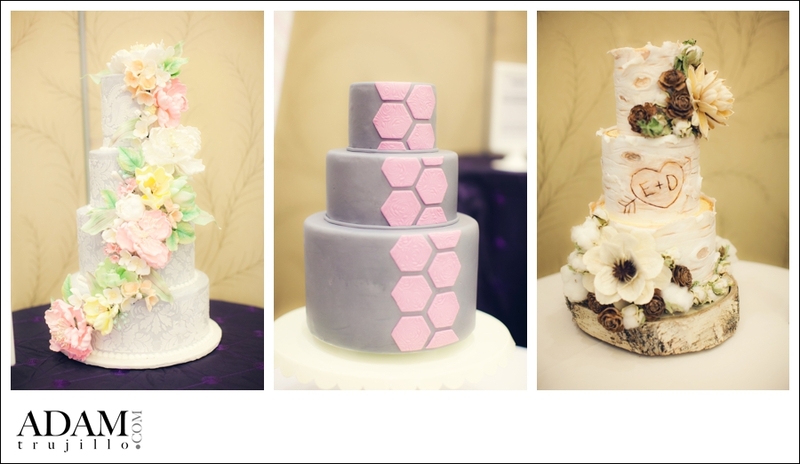 Wedding cake is great and I know guests love to chow down on goodies like these little delicious treats. With many flavors to choose from your cocktail hour or dessert bar can have some of the tastiest little sinful treats ever. Put down the calorie counter and enjoy yourself. I am not a sweets person but I would be lying if I said I didn’t enjoy a few of these cupcakes. Perfect Planning Wedding & Event Coordination had a colorful and loud table! If you are having a spring or summer wedding and looking for something funky this inspiration table has that solution. With soda pop bottles and chair decor that matches the colorful flowers the options are endless. Orange, pink, green and yellow jump out and look dashing and very nice. When playing with colors of this extreme I would highly suggest using a wedding design expert as a professional knows how to organize and deliver a high end product with any idea. DIY is nice but sometimes can cause a bigger headache than its worth and we all want your day to be an amazing experience. 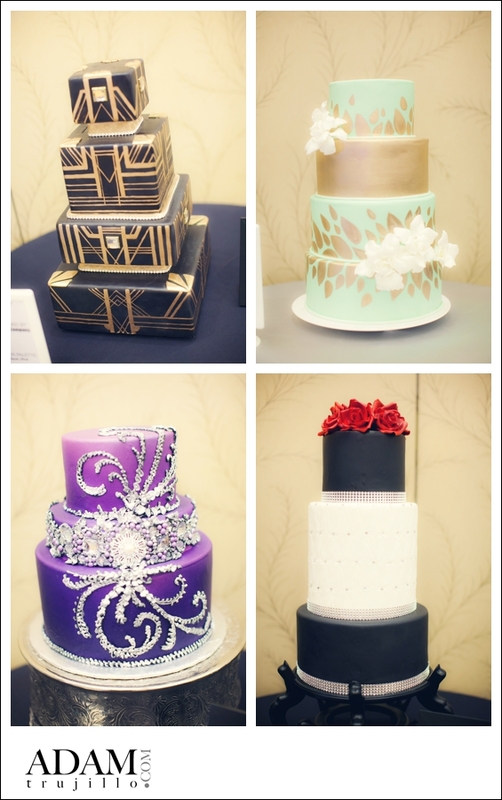 Next time you are in Portland and anywhere in the Northwest and getting married be sure to check out one of the fabulous bridal shows hosted by Luxe Event Planning.